What does Mark Cavendish have to do to ride the Rio Olympics? The Manxman is "keeping his options open" when it comes to riding on the track at the 2016 Games. Mark Cavendish described his appearance at last weekend’s Revolution Series meeting in Derby as him keeping his “options open” in regards to competing at next summer’s Rio Olympics. Cavendish finished second in the omnium, as well as winning the Madison with Bradley Wiggins in Derby, which effectively started his potential quest to make the British team at the 2016 Games. But how exactly does the 30-year-old Manxman earn selection for the omnium in Rio? It’s a five-point process, effectively. To be in the selection pool, UCI rules require Cavendish to qualify for this winter’s Track World Cup series – to do so, he must score 90 points at UCI-ranked events in the discipline in which he wants to compete at the Olympics. Second in Derby gave him 72 points, and he’ll race next week’s Internationales Radsport Meeting [August 28-29] in Dudenhofen, Germany in at attempt to score the remaining 18. “I’ve been really proud of his commitment,” said GB endurance coach Heiko Salzwedel. “His wife was due to give birth just after the Revolution event, but he rode there and was very keen to sign up to race in Germany.” Remember, the Madison is no longer an Olympic event. Cavendish then needs to score a paltry 10 points across this winter’s World Cup meetings and next March’s World Championships in London – the equivalent of finishing 24th or higher – in the omnium to be eligible for Rio. The most likely World Cup meeting he’d race is that in Cali, Colombia (October 30-November 1), as British Cycling will likely send an Academy squad to round two in New Zealand in December, and then a mix of Olympic contenders and emerging prospects to Hong Kong (January 16-17 2016). 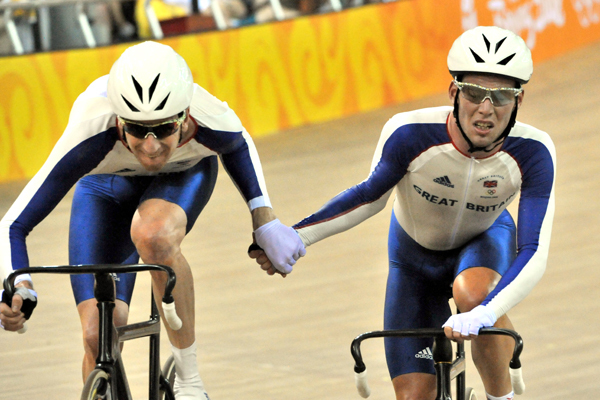 Mark Cavendish and Bradley Wiggins during the Madison at the Beijing Olympics, in which they finished ninth. Cavendish is normally between four and six weeks into his road season by the time the Track Worlds take place. Therefore, any of Cavendish’s potential employers on the road for 2016 will need to take this into consideration. The Manxman did state in Derby that he wants to ride next year’s Tour de France, which he did before the 2008 and 2012 Olympics. Only 18 riders – and eight from European nations – can compete in the omnium in Rio. Places are decided using the Olympic Track Ranking, which takes into account each country’s results in the discipline across major events dating back to 2014. The 18 best countries, taking into account the geographical restrictions listed above, will earn places in the event. Britain shouldn’t have any problems qualifying, but solid performances from our male riders in the omnium at international events this winter will ensure a spot for Rio. The final UCI Olympic Track Ranking 2014-2016 is published on February 29 next year, with the deadline for athlete entries to be made in July.